Sometimes, you need to decrease 2 stitches at the same time when knitting; this is called double decreasing. Certain stitch patterns depend on double decreases, and sometimes you need a double decrease in garment shaping. Double decreases can be right-slanting, left-slanting, or vertical — and you can make them on the knit side or the purl side of the fabric. Slip the stitch you just worked back to the LH needle. Bring the second stitch on the LH needle over the decreased stitch and off the needle. Return the decreased stitch to the RH needle. Slip the next stitch from the LH needle to the RH needle. Purl the next 2 stitches together. Pass the slipped stitch over the decreased stitch. Slip the next stitch on the LH needle as if to knit. Knit the next 2 stitches together. Bring the slipped stitch over the decrease stitch as if you were binding off. Slip this decreased stitch back to the LH needle. With the RH needle, bring the second stitch on the LH needle over the decreased stitch and off the needle. Slip the first 2 stitches on the LH needle to the RH needle (as if to knit). Knit the next stitch on the LH needle. 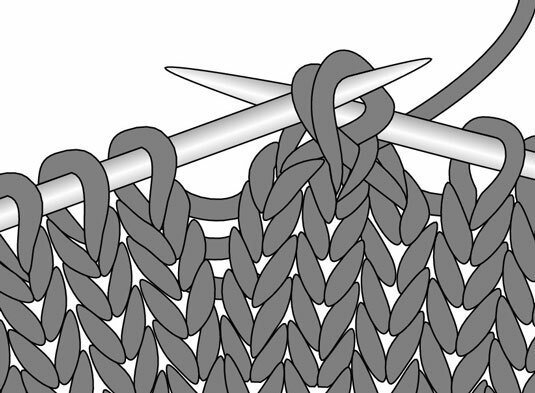 With the LH needle, bring both slipped stitches together over the knitted stitch and off the RH needle. For a vertical decrease, use the LH needle to bring both slipped stitches together over the knitted stitch and off the RH needle.